Preheat oven to 425°F and spray a large baking sheet with cooking spray. In a large bowl, combine chicken, cheese, salsa, and sour cream. Season with salt and pepper. Spoon about 3 tablespoons of chicken mixture in a line down the center of each tortilla. Tightly roll tortilla around mixture. Place taquitos seam-side down onto prepared baking sheet, making sure they aren’t touching so that they can get crispy all over. Spray generously with cooking spray and season with salt and pepper. I also sprinkled some chili powder and cayenne on top, but not necessary! Bake for 12 to 15 minutes, until golden brown and crispy. 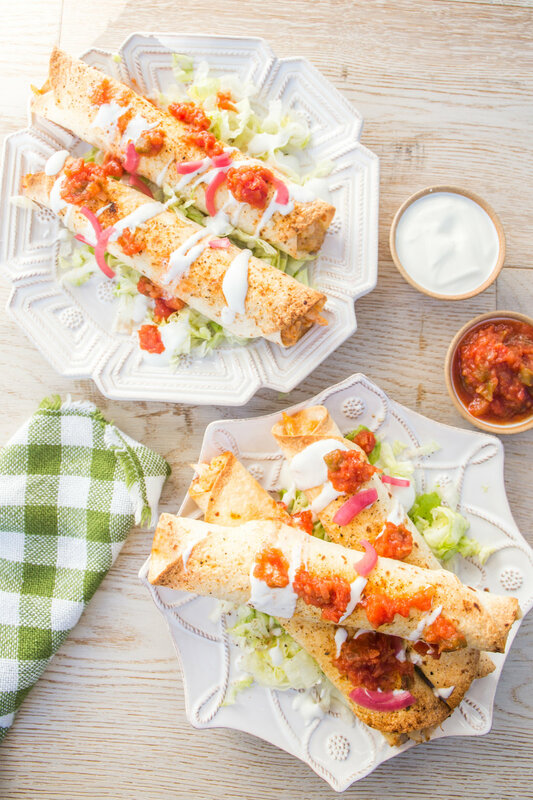 While the taquitos are cooking, chop up your lettuce and prepare any other toppings you’re going to serve with your taquitos. Serve immediately with desired toppings. I like to serve my taquitos over a bowl full of shredded lettuce to make it taco salad-y. My taquitos are pictured with the red onions from #JustMarriedCookbook on top. Vegetarian? Swap in a can of black beans or refried beans for the chicken. Vegan? Omit the cheese, and mix the beans with 1/2 cup of vegan cream cheese like Kite Hill. Gluten-Free? Use corn tortillas instead of flour! You’ll just need to warm them in the microwave between two wet paper towels for a few seconds to make them more roll-able. Get the smallest tortillas you can find to make mini appetizer taquitos! Buy a rotisserie chicken, pull the meat off the bones, and shred it for this recipe. Use the rest to make chicken nachos, a simple chicken soup, chicken salad, or a chicken quesadilla with any leftover tortillas! If you don’t eat all of the taquitos, allow them to cool completely before refrigerating, then reheat at 425°F until warm and crispy again, 4 to 6 minutes.